ASCOF Lagundi for all ages and needs. 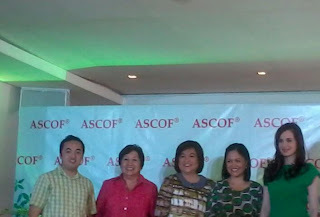 ASCOF's brand manager, Winnie Monsod, Winnie Cordero, Ms. Mia Pascual-Cenzon, ASCOF's Corporate Communications and host TV and radio personality Ariel Ureta during the launch. All mothers only want the best for their families. That’s why many moms today are constantly looking for safe, natural and effective ways to care for their loved ones. As moms, we would often do our own research, we ask friends, go over the Internet for further sources, among many others. More and more Filipino Moms are rediscovering plant-based remedies based on the traditional medicine practices as safer alternative to synthetic chemical based ones. 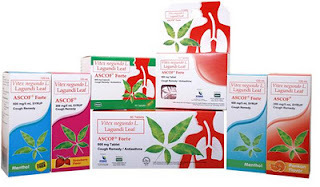 So it comes as no surprise that ASCOF Lagundi, the number one herbal cough and asthma remedy brand and the most successful phytomedicine (plant-based drug) in the market today. Manufactured by one of the most trusted drug companies in the country, PascualLab, ASCOF is made from 100% natural and all-organic lagundi leaves, grown and nurtured by their company’s award-winning and certified all-organic LAC farm found in Nueva Ecija. ASCOF’s Lagundi is the first plant-based medicine registered under the Food and Drug Administration (FDA), it was developed through years of scientific research and validated by clinical trials. It continues to follow the strict standards of the World Health Organization and the Philippine FDA. The three TV personalities surely had fun with Mareng Winnie laughing her heart's out to the silly banters of radio tandem Ariel Ureta and fellow ASCOF ambassador Winnie Cordero. ASCOF welcomes its two new brand ambassadors, TV personalities Winnie Monsod and Winnie Cordero. Both women are experts in their fields and are firm believers of the natural healing power of nature. 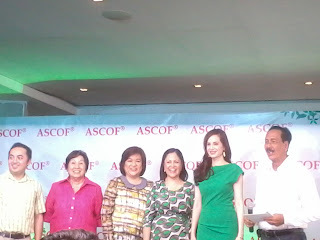 They both join fellow nurturing mom, Congressional Representative Lucy Torres-Gomez, as ASCOF spokespersons and advocates of safe, natural medicine. Traditional medicines are something Mareng Winnie have always respected because she had experiences that were working very well. “I used to do research on cancer and sometimes I would find that holistic medicines work better. With ACOF backed by clinical trials, you can be assured that it’ll work even better than synthetic chemical based medicines.” Mareng Winnie says she is picky about the products she speaks for. But she didn’t have to think twice for ASCOF because it is made from natural and organically-grown leaves, has passed stringent safety standards and is made by a reputable company which is PascualLab, so she has agreed to do it. Congresswoman Lucy Torres-Gomez is also firm believer in natural medicines because she grew up in their midst back in Ormoc. “I also basically grew up using natural herbs, like when I would get sick, my yaya (nanny) would make us have sponge bath using boiled water with guava leaves with stampita prayers and everything,” recalls Congresswoman Lucy Torres-Gomez. ASCOF Lagundi Syrup for KIDs and adults. Purple Plum Fairy thanks ASCOF and Mr. Vincent Lantin of Yehey Digital Group for the invite. While you’re at it, please don’t forget to like our Facebook Page Purple Plum Fairy.